“Rain, rain go away come again another day.” I, knitorious want to agitate the fibers of wool roving into a beautiful piece of cloth. Welt felting requires a location conducive to the use of warm water, olive oil soap, bubble wrap and an abundance of manual labor. My backyard presents the perfect venue for such an undertaking. Between cloud cover, sprinkles and a light breeze, I proceeded to full some gorgeous turquoise blue and teal blue roving into a square. “Well…almost a square.” After the layers of roving began to full, pieces of yarn were added freeform. Rolling the sandwhich of roving and yarn between the layers of bubble wrap, the wool roving and yarn became one unique piece of fabric. After the fulling was complete, I rinsed the square in cool water. 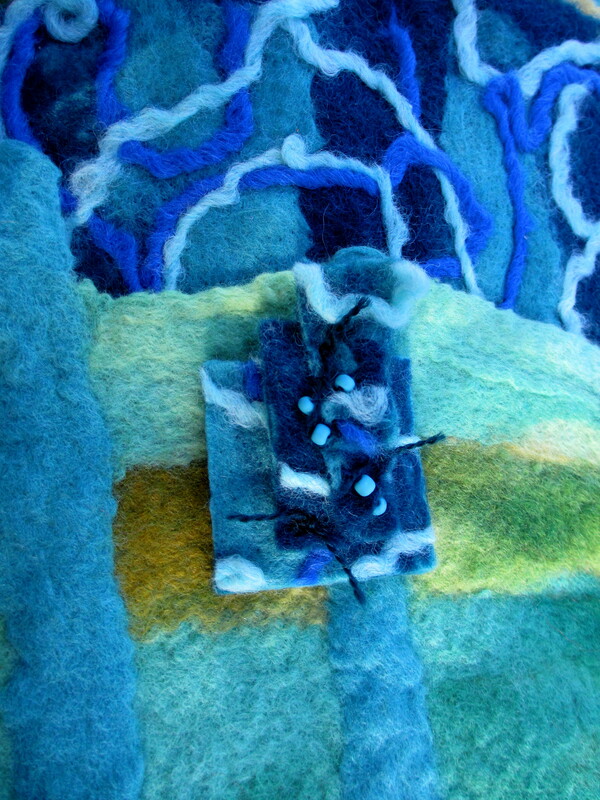 The piece of wool felt was left to dry for a couple of days. I began to cut and build layers creating a topographical element of peaks and valleys accented with beads and wool thread. What began as a two-dimensional piece of fabric metamorphosed into a three-dimensional sculpture.